He found the Spider in his clothes again that morning. It wasn’t the first time he found the Giant House Spider in his study. She was always in the same spot and every time he would disturb her, picking up his clothes, she would run top speed across the room, to find another hiding place. And He would try to catch her, but She could make herself very small if she bended her knees, and she could fit in very small corners. Eventually, he would manage to get her in a big pint glass, with a magazine at the bottom and would gently put her outside, in the garden which is on the other side of the building. Nevertheless, she was always back, in that very same spot. He was amazed by her stubbornness. Somehow, she would always make her way back, without being seen, by anyone. Was she creeping across the house at night when everyone was asleep? or was she racing the journey back during the day, in plain sight? He thought she had escaped when she fell off his hoody when he picked it up from the pile of clothes left on the floor. She fell and landed on her feet, her legs starting to run at top speed as she touched the carpet, to race across the room to find a hiding place. Just when he thought she had successfully escaped, his eyes sweeping over the carpet, he saw her trying to camouflage herself along a box on the floor. He put the big pint glass around her and watched her. He couldn’t help admiring the beauty of the marking on her back, she was of a decent size for a Eratigena atrica. He called her to come and meet her. He wanted to find out why the spider kept coming back and what was her message. The spider was trying to climb up the edges of the glass unsuccessfully. She gave up and decided to wait, bending her knees, gathering her legs around her body. 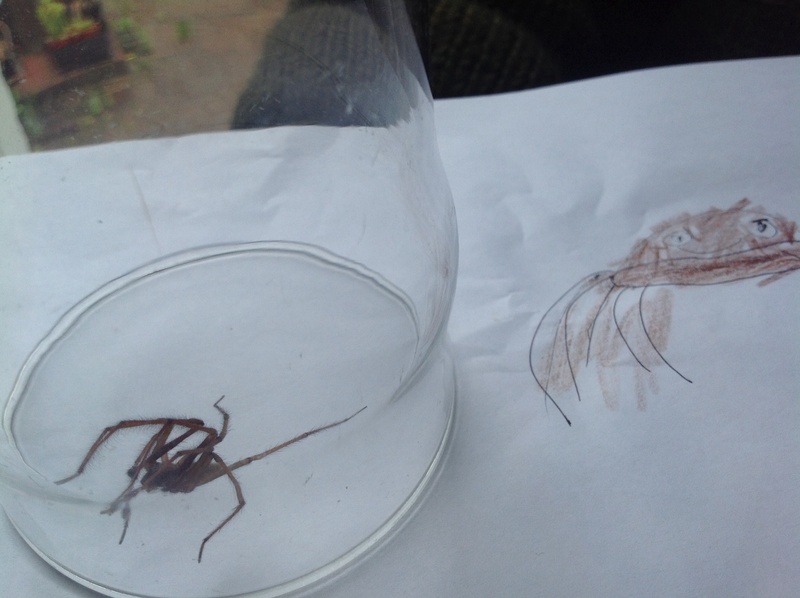 Her little boy who was sat near the glass, staring in awe at the spider decided to call her “Savvy”. He left the room to draw a picture of her. “Why do you keep coming back in the same spot?” she asked softly to the spider who had now started to relax a little. Her answer was brief: “Warmth, darkness, comfort. It’s going to get colder soon, I must find a place for winter now, that’s the best place I have found”. – Yes, and I’ll continue to be until I find the exact spot where no one sees me or cares that I’m there. When you find a good spot it takes a few attempts to be able to settle in. – I want to get out, I don’t like it where I am now (the glass). – Yes, maybe. I don’t want to have to compete over territory with others though. Here is good because I’m the only one. I have room to re-populate the place, it’s quiet and cosy. – You keep hiding in our clothes though… Clothes that we need to wear everyday. Should we let you out so you can decide for yourself where you would like to go? – Can you not come back in this very spot, in our clothes? Maybe you could find a spot not as comfy but out of the way? – I never know if I’m in the way until I’m found, chased or caught. – Be careful. some people are afraid of you and might want to kill you. – I’m afraid of people, I don’t kill them. – Yes be careful please spider, I don’t want you to get into trouble. How could we make your life happier? – You could let me stay and hide here? – No I can’t have you running around here and not knowing where you’re hiding, but you are welcome to live in our shed… Should we try? If you don’t like it you will be able to escape through the window, as we’ll leave it open all day today. We will drop you gently near the window, so if you don’t feel safe, you can escape and go somewhere else..
– I’m scared of birds, they eat spiders. – You’ll have to be careful then, Savvy the Spider. Do you have a message for me? Focus and remain focused. Sharpen your senses, keep moving forward with intent.